How the Washington Nationals GM rose from minors to management. 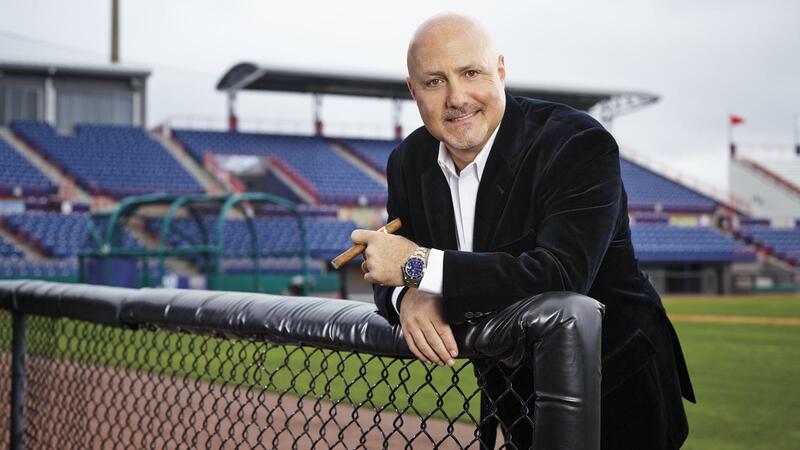 Mike Rizzo arrived early one February morning in 2009 at the Washington Nationals Space Coast Stadium spring training complex in Viera, Florida, to put in another day at his job of assistant general manager and to be general manager Jim Bowden’s “right hand man,” as Rizzo put it. Though he didn’t know it yet, that day would be the day that the “right hand man” would be asked to save the bacon of the baseball franchise plunged into an international scandal by the very man Rizzo was there to work for. Team president Stan Kasten walked into Rizzo’s office later that day, sat down, and told Rizzo the story of Esmailyn “Smiley” Gonzalez: that the 16-year-old Dominican shortstop phenom they signed for $1.4 million in 2006 turned out to be a 20-year-old—well past his Dominican development prime—named Carlos David Alvarez Lugo. The Nationals had been defrauded for $1.4 million (the team is currently suing an insurance company to recover $1 million of that money) and it appeared that Bowden’s friend and special assistant, Dominican native and former Cincinnati Reds pitcher José Rijo, may have been involved. “It was really a mess,” Rizzo says. Kasten gave Rizzo a mission—to get them out of the Dominican talent operation they were involved in, and start a whole new operation, cutting ties with the existing academies, find a new facility to house their 75 Dominican players, and find a whole new staff. “I felt like General Marshall putting Ike in charge of the Normandy invasion,” Kasten says. “Stan wanted to be able to say we are in front of this,” Rizzo says. “He asked me if I could handle it.” Rizzo told Kasten he could do it. Of course, he could do it. This is what Rizzo was waiting for, ever since he passed on a similar job with his friend Ned Colletti with one of the most storied franchises in all of sports­—the Los Angeles Dodgers—to take a job with the lowly Nationals, the relocated Montreal Expos, in just their second season in Washington. Bowden had been fated to screw up. It wasn’t a matter of if, but when, for the self-destructive, flamboyant general manager who had endeared himself to the Lerner family, the owners of the Nationals. So the path to the top for Rizzo was more likely in Washington than in Los Angeles—where, ironically, the man who hired him, Kasten, is now the team president and part-owner of the Dodgers. It took nearly three years, but Mike Rizzo’s moment had come. He had been preparing for this on all those years of scouting trips, working his way up as a baseball grinder through the systems with the Chicago White Sox, Boston Red Sox and Arizona Diamondbacks. He had been to the Dominican Republic many times to scout kids who were all supposed to be Smiley Gonzalez. Rizzo called in all the chips he had accumulated in those grinder years. He made some calls to his Dominican contacts, telling them what he needed to do, and that it had to be kept secret. Rizzo flew into Santo Domingo that day. Waiting for him at the airport was someone he “trusted exclusively to have the power down there to help me make this shift,” he says. He was about to cut ties with a very popular figure in the Dominican Republic in José Rijo, and fire the entire staff of the current Nationals Dominican training academy. So, flanked by security provided by Major League Baseball, Rizzo began the move. He reached out to Rawlings, which was building a new academy, and they agreed to let the Nationals use the facility until they found a new home. He found a beachfront resort in Boca Chica that could feed and house all the players. Then he went to academy at San Cristobal, met with the staff and, with a bilingual attorney present, fired about 20 staffers, including Rijo. He then called the 75 players at the academy out for a meeting in center field and gave them an impassioned speech about what happened and how this wasn’t going to affect their futures. Then he loaded them on two school buses, filled up two moving trucks with the Nationals’ equipment, and took them to their brand new baseball academy, where Rizzo had already put a new staff in place. Kasten introduced Rizzo and indicated that he would be handling the general manager duties. After the press conference, later that day, as the sun set on Space Coast Stadium, Rizzo pulled a cigar out of his humidor, went out on the balcony outside his office, and fired it up. “That was the moment for that,” he says. It was the moment the Washington Nationals stopped being baseball’s laughingstock, and became the baseball team that would win the National League East three years later and become a perennial pennant contender. The strangest part of this story is that Rizzo had MLB security to help him. Usually, it’s the other way around. Then he pulled one of the winningest managers in baseball history out of his pocket—Davey Johnson, who had been out of Major League Baseball for 10 years—and gave him the job. The following year, Johnson would lead the Nationals to the National League East division title. He believed he was protecting his player when he went after umpire Phil Cuzzi to protect his catcher, Pudge Rodríguez, who he felt was being baited by the umpire, following a 1-0 loss to the New York Mets in 2011. He was suspended for one game, the only general manager in recent memory to be suspended. Rizzo would take on Cole Hamels as well in 2012 when the Phillies pitcher hit rookie Bryce Harper with a pitch just to send the cocky kid a message. He got fined by the commissioner’s office for that one. “I am who I am and I’m comfortable in my own skin,” the 53-year-old Rizzo says. “That said, however, not a day goes by that I don’t try to learn and grow, both as a GM and as a person, and I do regret that these situations played out publicly. That personality was forged from his father, Phil Rizzo, a former minor-league ballplayer who left the game to drive a truck in Chicago and work as a baseball scout in a working-class neighborhood about five miles west of Wrigley Field. Rizzo went to Holy Cross High School, where he played football, (a linebacker of course), and basketball, as a point guard. Baseball was where his heart was, though. A shortstop, Rizzo would go on to St. Xavier University in Chicago, where he was drafted by the California Angels. He would play infield in the Angels system with future major leaguers like Devon White and Wally Joyner. Rizzo, though, was not a future major leaguer. After three minor-league seasons, he was released by the Angels. He sat down at the family kitchen table and talked to his father about his options. Phil Rizzo—by then a full-time scout—told his son the tough news. He didn’t have major league talent. But a friend who was a baseball coach at the University of Illinois offered him a job as a coach. It gave Rizzo a chance to finish school and get his degree. “It turned out to be the best thing I could have done,” Rizzo said. Larry Himes, who was the Angels scouting director when Rizzo was drafted, got hired as the Chicago White Sox general manager in 1986. He remembered Rizzo the player as a good candidate for being a scout—just like his father. “He had it in his blood,” Maddon says. Rizzo began his career as the classic “grinder”: scouting players in small towns across the country, driving thousands of miles, staying in motels, eating sandwiches, filling out countless scouting reports detailing every pitch and play. He signed Hall of Famer Frank Thomas in 1989, and moved to the Boston Red Sox in 1992. He may have celebrated the move with a smoke, because this was when Rizzo became a cigar lover. “You started seeing boxes of cigars at functions, and I would light one up, and really grew to enjoy it,” Rizzo says. It’s also when he became a Cigar Aficionado fan, the same time the magazine was born. “I’ve still got stacks of the magazine dating back 20 years in my house,” he says. Respect was in short supply for the Nationals, but Rizzo began garnering it by helping build another outstanding farm system while the major league club, under Bowden’s direction, turned into a motorcycle gang, a group of baseball’s rejects. The Smiley Gonzalez scandal was the last straw, and Bowden was forced to resign. Kasten named Rizzo interim GM, and after a series of interviews with other candidates, gave him the permanent job. It was painful. He fired manager Manny Acta after the team posted a 26-61 halfway through the season, and made bench coach Jim Riggleman the manager. They lost 103 games—the second straight season of 100-plus losses. But in June of that year Rizzo took a big step forward when, with the No. 1 pick in the 2009 draft, they selected Strasburg. One year later, with the No. 1 pick, he drafted Sports Illustrated cover boy Bryce Harper. After a disappointing season last year, falling short of the play-offs, the Nationals are considered a contender again. Rizzo, who was promoted to team president and given a contract extension last year­, hopes he’ll be lighting up one of those Montecristos—for a special occasion. Thom Loverro is the cohost of a sports talk radio show on ESPN 980 in Washington and a sports columnist for The Washington Times. He has covered sports in Washington for more than 20 years.